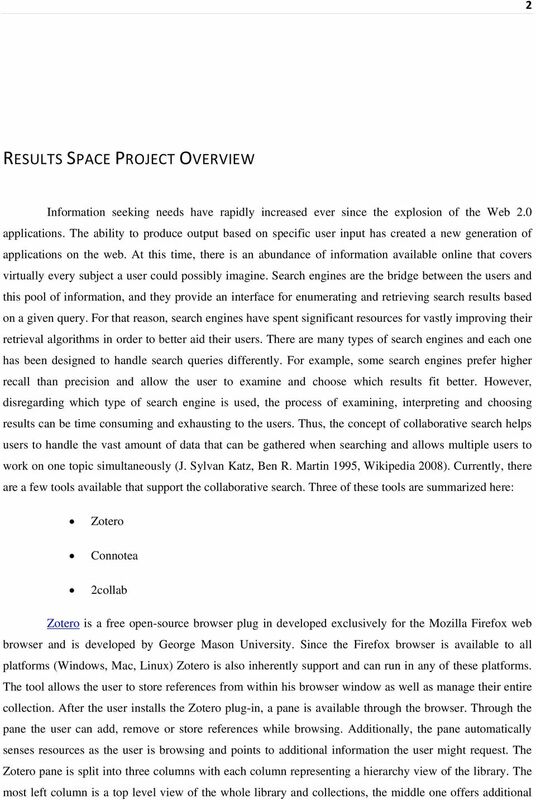 Download "Headings: Results Space. Android OS. Mobile software development. 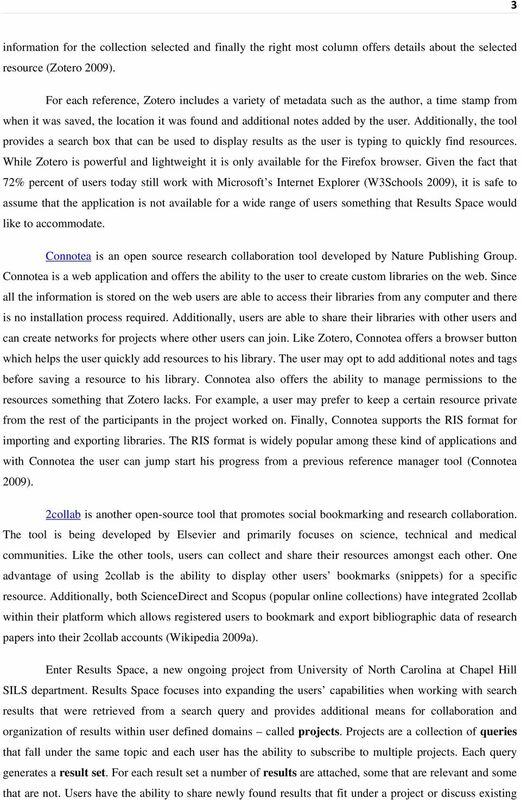 Research Collaboration"
6 4 results previously submitted by other users. This enhances the collaboration amongst users and allows for increased productivity when working at a specific subject. Multiple users can execute different queries against different search engines and report their results. 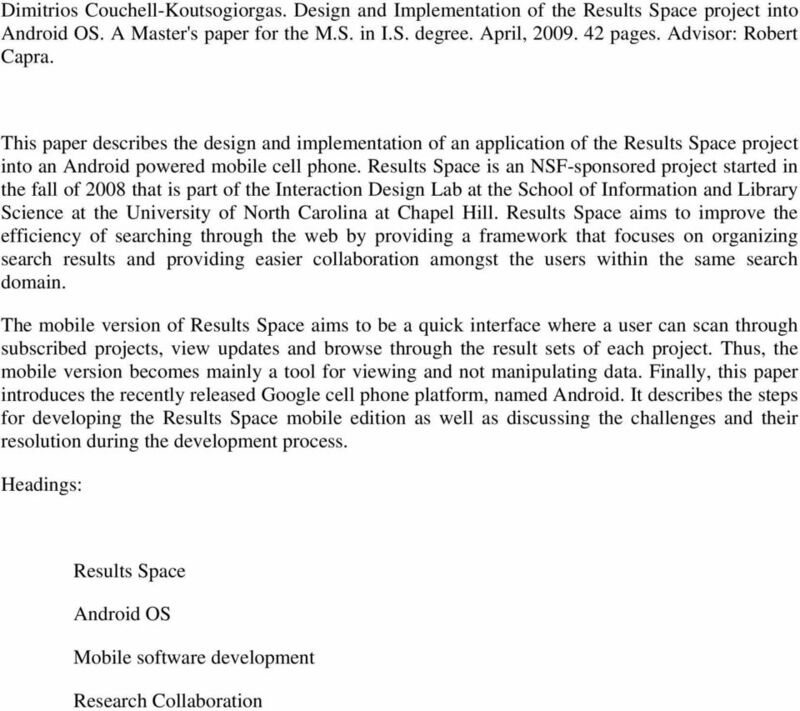 RESULTS SPACE MOBILE Given the nature of Results Space, a mobile version was desired. Users today are always on the road and today s mobile phones provide strong frameworks for custom applications to be built. With the mobile version, users will have the ability to browse their subscribed projects, view updates on a given project (e.g. if a new result was added or reviewed by other users), and browse project results through a web browser. Its primary goal is to provide on-the-go functionality for Results Space project while deferring to the full screen interfaces to Results Space for the manipulation of data. Finally, the first version will also provide a framework for future versions to come. Presently, there are a variety of mobile platforms available on the market and each was thoroughly examined before deciding which platform would be used. Apple s iphone is currently the most popular platform and the SDK is well documented. However, the development environment is limited only to Apple computers and thus it excludes a large group of potential developers who do not own an Apple computer. Microsoft s Windows Mobile platform also has a large number of deployed devices. There is a variety of development tools for the Windows Mobile platform; however, those that are free only support writing code for native mobile applications which makes them more complex, and difficult to maintain (Heil D., 2006). On the other hand, the rest of the development options are expensive, such as Visual Studio which costs approximately 250$. The latest entry on the mobile platform is from Google with the Android OS. 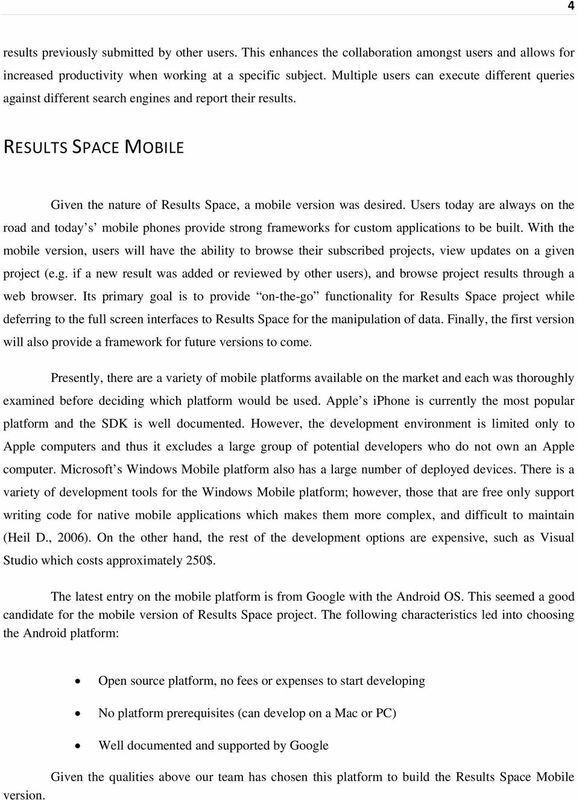 This seemed a good candidate for the mobile version of Results Space project. The following characteristics led into choosing the Android platform: Open source platform, no fees or expenses to start developing No platform prerequisites (can develop on a Mac or PC) Well documented and supported by Google Given the qualities above our team has chosen this platform to build the Results Space Mobile version. 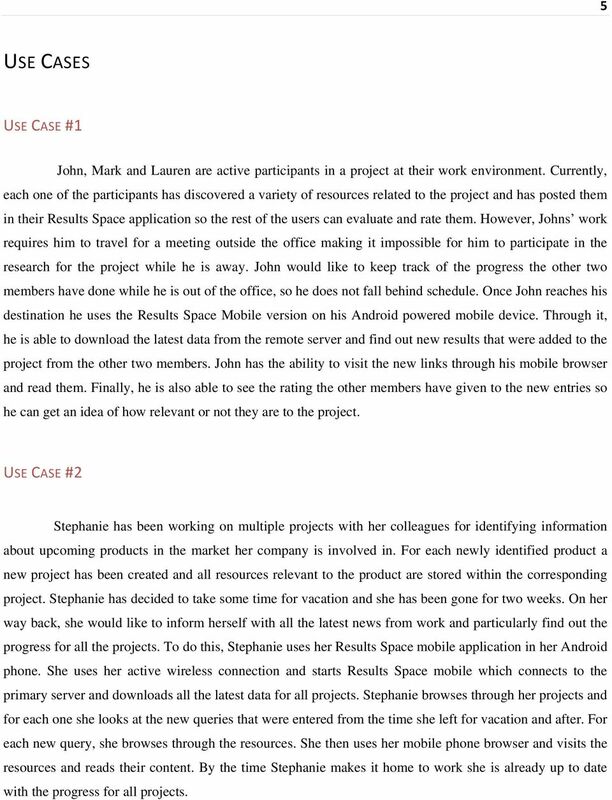 7 5 USE CASES USE CASE #1 John, Mark and Lauren are active participants in a project at their work environment. Currently, each one of the participants has discovered a variety of resources related to the project and has posted them in their Results Space application so the rest of the users can evaluate and rate them. However, Johns work requires him to travel for a meeting outside the office making it impossible for him to participate in the research for the project while he is away. John would like to keep track of the progress the other two members have done while he is out of the office, so he does not fall behind schedule. Once John reaches his destination he uses the Results Space Mobile version on his Android powered mobile device. Through it, he is able to download the latest data from the remote server and find out new results that were added to the project from the other two members. John has the ability to visit the new links through his mobile browser and read them. Finally, he is also able to see the rating the other members have given to the new entries so he can get an idea of how relevant or not they are to the project. USE CASE #2 Stephanie has been working on multiple projects with her colleagues for identifying information about upcoming products in the market her company is involved in. For each newly identified product a new project has been created and all resources relevant to the product are stored within the corresponding project. Stephanie has decided to take some time for vacation and she has been gone for two weeks. On her way back, she would like to inform herself with all the latest news from work and particularly find out the progress for all the projects. To do this, Stephanie uses her Results Space mobile application in her Android phone. 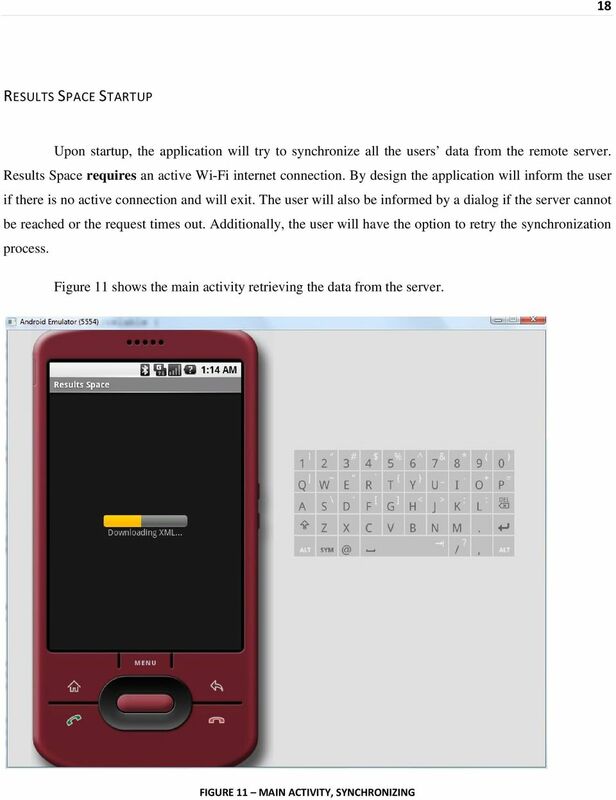 She uses her active wireless connection and starts Results Space mobile which connects to the primary server and downloads all the latest data for all projects. Stephanie browses through her projects and for each one she looks at the new queries that were entered from the time she left for vacation and after. For each new query, she browses through the resources. She then uses her mobile phone browser and visits the resources and reads their content. By the time Stephanie makes it home to work she is already up to date with the progress for all projects. 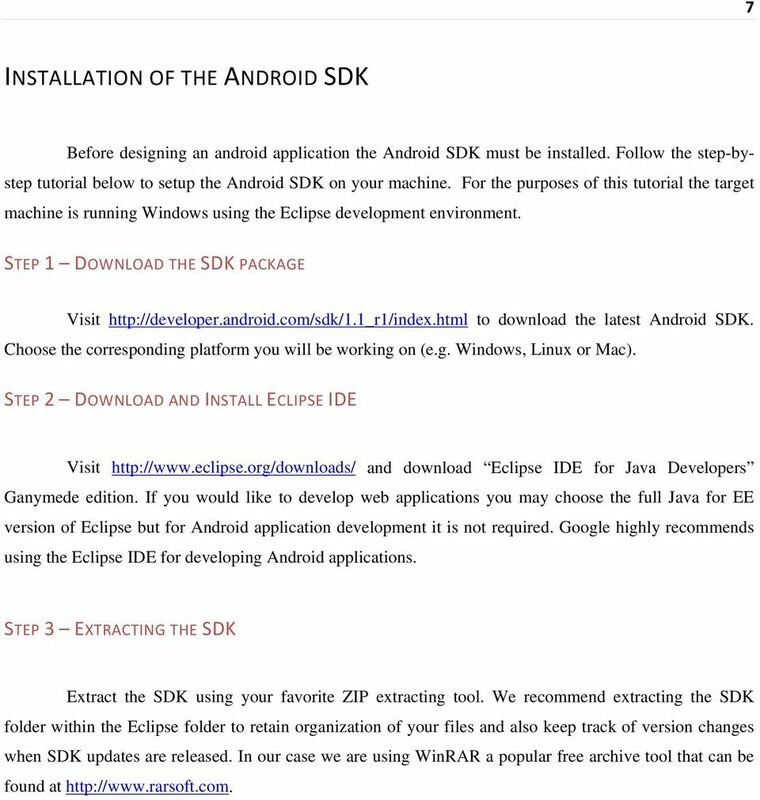 12 10 This completes the step-by-step guide for downloading, installing and configuring the Android SDK on your machine. You will now be able to create and debug Android applications. For troubleshooting and additional support for other platforms such as Linux or Mac, you may visit the official Android for Developers webpage can be found at APPLICATION FUNDAMENTALS Android applications are written in Java programming language. However, it is important to remember that they are not executed using the standard Java Virtual Machine (JVM). Instead, Google has created a custom VM called Dalvik which is responsible for converting and executing Java byte code. All custom Java classes must be converted (this is done automatically but can also be done manually) into a Dalvik compatible instruction set before being executed into an Android operating system. Dalvik was created to support the nature of lightweight mobile operating systems require because of the limited hardware included compared to conventional desktops or laptops. An Android application is complex and consists of various different files that are all tied together. 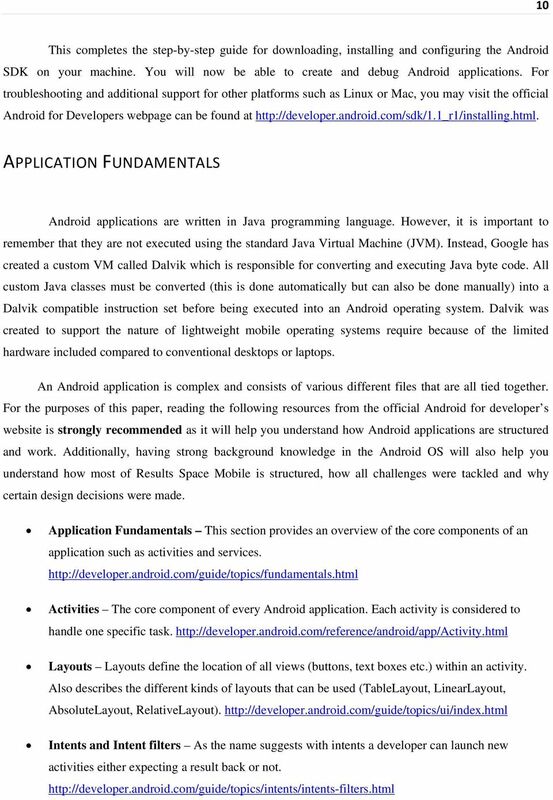 For the purposes of this paper, reading the following resources from the official Android for developer s website is strongly recommended as it will help you understand how Android applications are structured and work. Additionally, having strong background knowledge in the Android OS will also help you understand how most of Results Space Mobile is structured, how all challenges were tackled and why certain design decisions were made. Application Fundamentals This section provides an overview of the core components of an application such as activities and services. 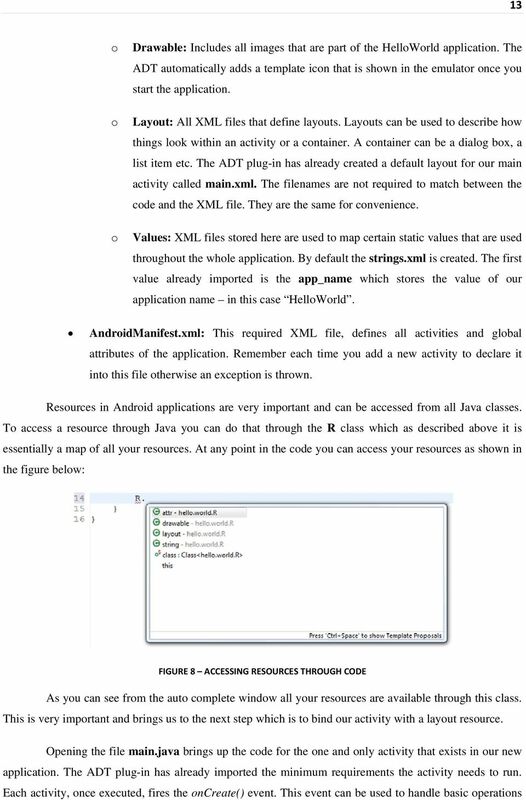 Activities The core component of every Android application. Each activity is considered to handle one specific task. Layouts Layouts define the location of all views (buttons, text boxes etc.) within an activity. Also describes the different kinds of layouts that can be used (TableLayout, LinearLayout, AbsoluteLayout, RelativeLayout). Intents and Intent filters As the name suggests with intents a developer can launch new activities either expecting a result back or not. 14 12 Click Finish to complete the process. 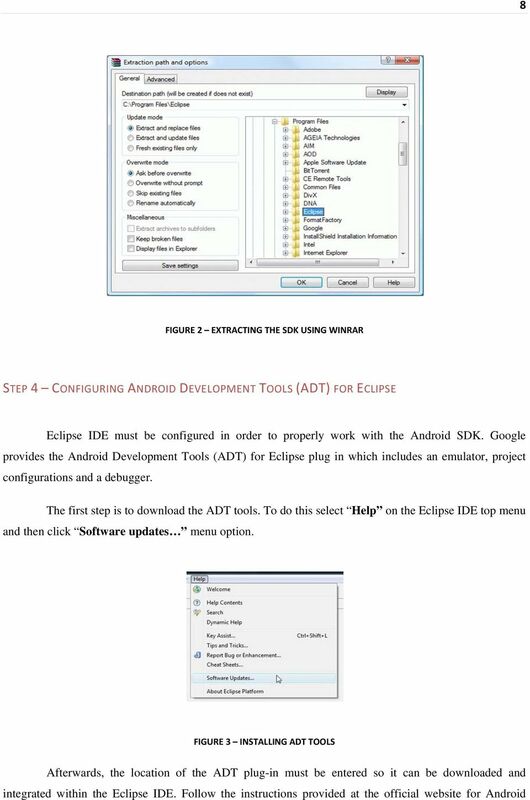 At this time the ADT plug-in has created a default folder structure that each Android application has. The structure looks like this: Each folder has a different meaning. 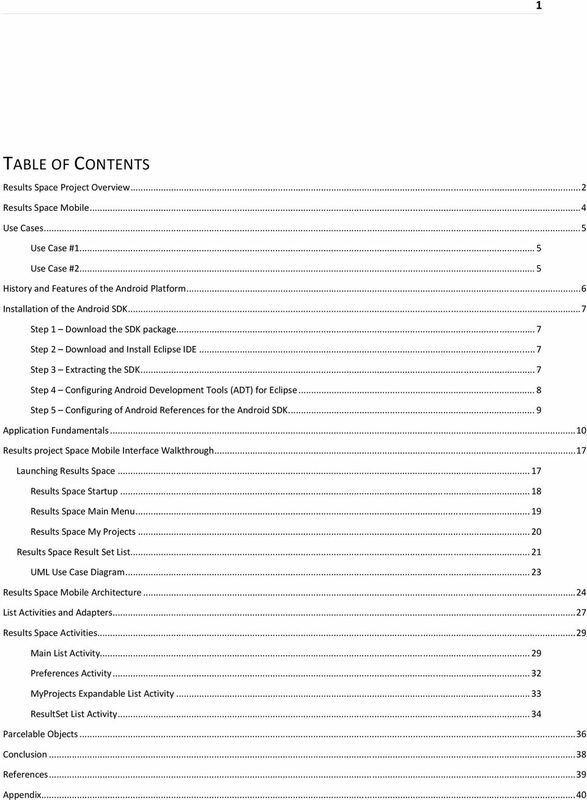 In particular: FIGURE 7 ANDROID APPLICATION SKELETON Src: Includes all the source code files written in Java. In our example the ADT already created two files: o o Main.java: Contains the code for our main activity which is also our starting activity. R.java: This file contains integer pointers in hexadecimal to all resources (hence the name R ) of the helloworld application. Google has decided to use integers to identify all resources as they are the quickest to read and smallest to store in a mobile phone. You are not allowed to edit this class manually, this class updates automatically when you add a new resource. 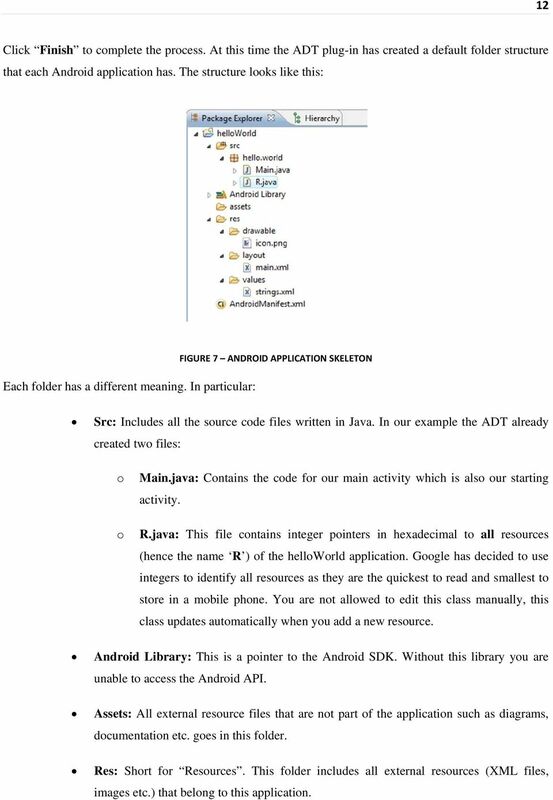 Android Library: This is a pointer to the Android SDK. Without this library you are unable to access the Android API. Assets: All external resource files that are not part of the application such as diagrams, documentation etc. goes in this folder. Res: Short for Resources. This folder includes all external resources (XML files, images etc.) that belong to this application. 16 14 the application needs in order to start. For example, we can use this function to load user preferences or contact a web server before we display anything to the user. However, the first step an activity often does is to bind to a layout. Layouts are XML files that describe the items and their attributes that exist within the activity. As an option, a developer may instantiate elements at runtime but this becomes cumbersome and time consuming compared to XML files. To bind to a layout an activity calls the setcontentview(int reslayoutid) function. In Snippet 1, you can see that the parameter required for this function is an integer. This brings us back to the R class that includes integer pointers to all of our resources. 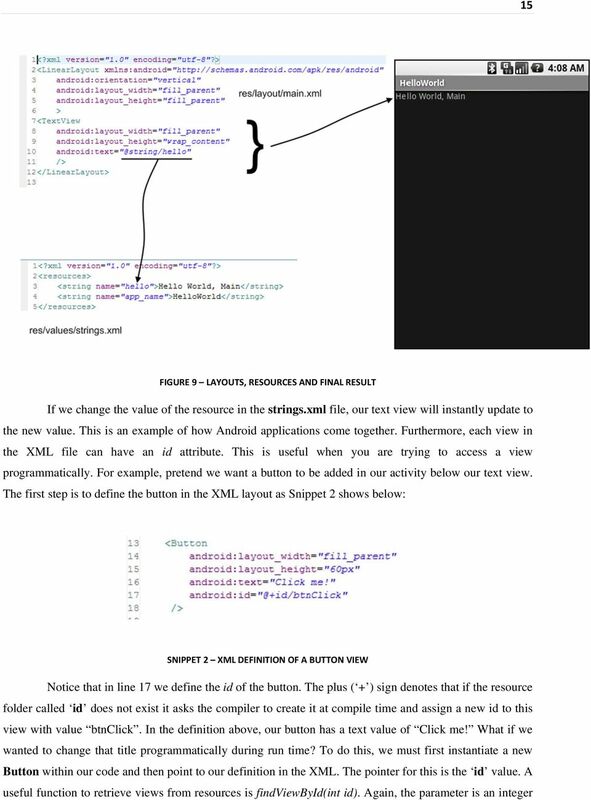 In order to point to our main.xml layout we just do the following: SNIPPET 1 BINDING AN ACTIVITY WITH A LAYOUT This automatically tells the main activity to bind to the main.xml layout. 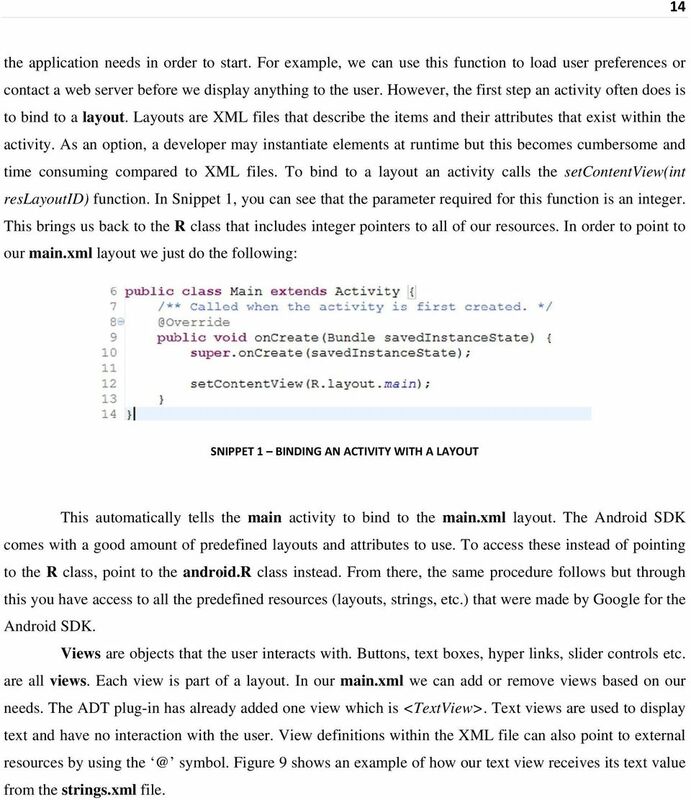 The Android SDK comes with a good amount of predefined layouts and attributes to use. To access these instead of pointing to the R class, point to the android.r class instead. From there, the same procedure follows but through this you have access to all the predefined resources (layouts, strings, etc.) that were made by Google for the Android SDK. Views are objects that the user interacts with. Buttons, text boxes, hyper links, slider controls etc. are all views. Each view is part of a layout. In our main.xml we can add or remove views based on our needs. The ADT plug-in has already added one view which is <TextView>. Text views are used to display text and have no interaction with the user. View definitions within the XML file can also point to external resources by using symbol. Figure 9 shows an example of how our text view receives its text value from the strings.xml file. 18 16 which leads us back to the R class that stores an integer pointer to our button. 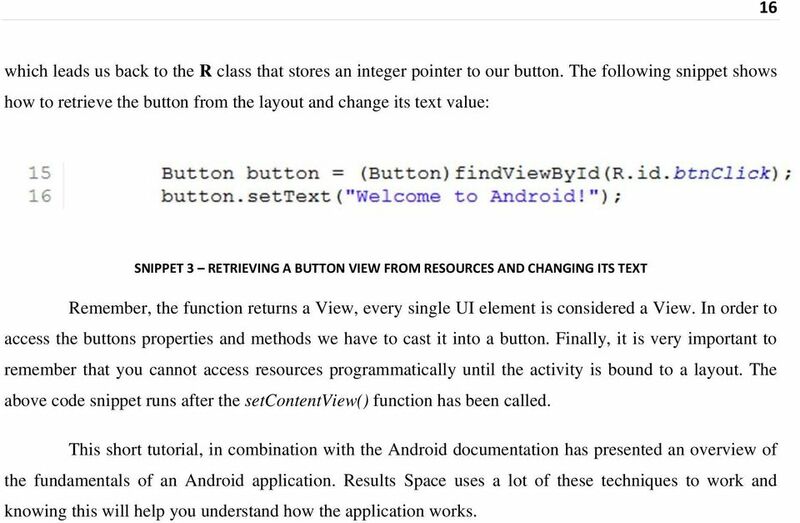 The following snippet shows how to retrieve the button from the layout and change its text value: SNIPPET 3 RETRIEVING A BUTTON VIEW FROM RESOURCES AND CHANGING ITS TEXT Remember, the function returns a View, every single UI element is considered a View. In order to access the buttons properties and methods we have to cast it into a button. Finally, it is very important to remember that you cannot access resources programmatically until the activity is bound to a layout. The above code snippet runs after the setcontentview() function has been called. 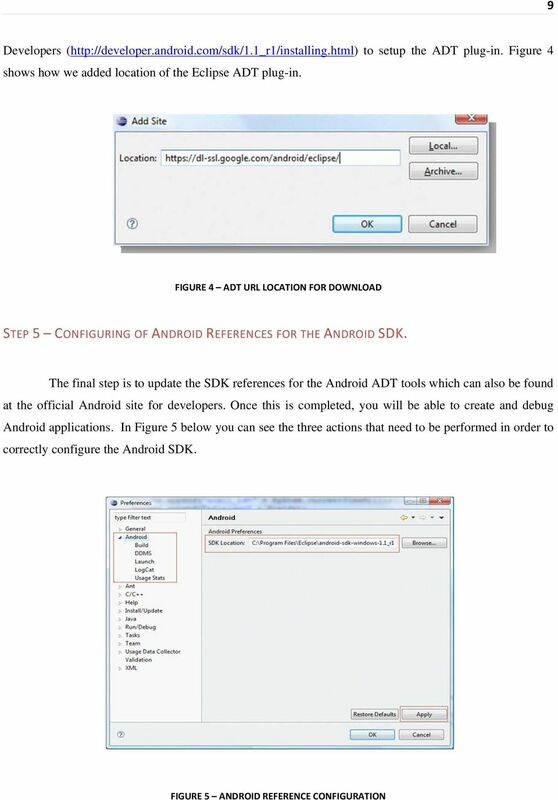 This short tutorial, in combination with the Android documentation has presented an overview of the fundamentals of an Android application. Results Space uses a lot of these techniques to work and knowing this will help you understand how the application works. 21 19 RESULTS SPACE MAIN MENU After synchronization is completed, the main activity will display the main menu. The main menu includes two options. The first allows the user to browse their projects while the second allows the user to update their preferences. Figure 12 displays the main menu. FIGURE 12 MAIN ACTIVITY, MAIN MENU (SYNCHRONIZATION COMPLETED) To view project details the user must click select the My Projects node. The number in parenthesis indicates the amount of projects the user is subscribed into. The user may wish to resynchronize data from the web server in order to receive latest updates. Clicking the menu button on the phone brings up a context menu with the Resynchronize button. Clicking the button restarts the main activity which ultimately receives the latest data from the server. 23 21 RESULTS SPACE RESULT SET LIST Once the user clicks on a result set child node, the ResultSetList activity is shown. The primary function of this activity is to display all the results within a result set in a simple list. Results in a result set show the title, URL, and stars to indicate the rating of that result by the members of the project. Figure 14 shows the results included in the apoptosis result set shown in Figure 13. 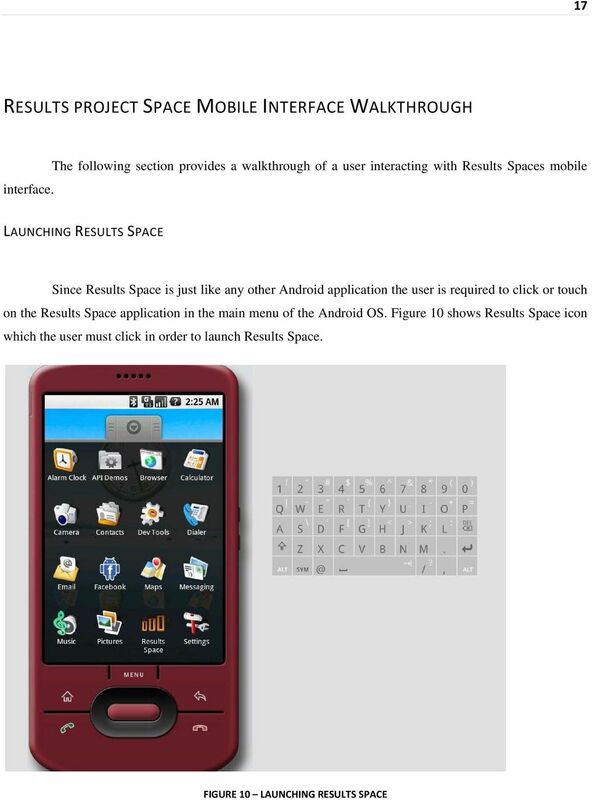 FIGURE 14 RESULT SET LIST ACTIVITY Clicking on a result launches the default web browser associated with the Android phone. The default browser supports multiple windows which allow the user to browse multiple results from a result set. Figure 15 shows this functionality after clicking the BioMed Central link shown in Figure 14. 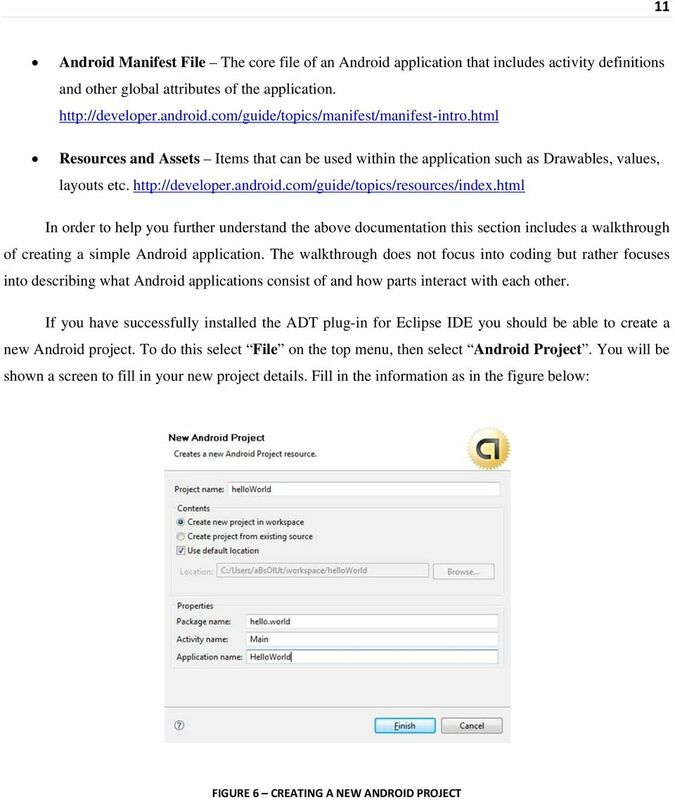 24 22 FIGURE 15 CLICKING ON A RESULT LAUNCHES THE DEFAULT ANDROID BROWSER WINDOW This gives the ability for to the user to skim through the web page and decide if it contains important information for the corresponding project. Based on our design, the first version of Results Space Mobile will not allow the user to update the ratings or snippet sections of a result. The purpose of the first version of Results Space is to give users the ability to view their data on the fly using an Android powered mobile phone. 25 23 UML USE CASE DIAGRAM Based on the following UML use case diagram we can see the major operations that occur when a user is interacting with Results Space Mobile. Once a user executes the application, it automatically tries to connect to the remote server. The remote server is standing by for all synchronization requests (include those where the user is trying to resynchronize data). The remote server then is responsible for outputting the XML which includes all the necessary data and for sending it to the users application. From then and on, the user can view his projects, view result sets that belong to a project and browse a result within his browser. 28 26 FIGURE 18 A SAMPLE PROJECT RETRIEVED IN XML FORMAT As the worker thread is parsing the XML all nodes are translated into Java classes (data objects) so they can be accessed programmatically. As mentioned in the introduction section for Results Space, all objects must be translated from XML into Java data objects. Thus for each object definition we have to create the corresponding Java class. The following classes are defined: Project Class that includes properties such as the name of the project, description and all result sets associated with it. A project consists of multiple result sets depending on the query entered. Multiple users can subscribe into a project. ResultSet A result set encapsulates two major lists. One for results and one for queries. Subsequently, for each query in the result set the date the query was issued and the user who first issued the query are stored. Additional attributes for result sets such as, creation date or other notes included are stored and allowed for access. A result set is always part of a project. 29 27 Result Class that holds information for a valid result. The URL, rating and snippet of the result is stored within this class. Ratings are used to identify which results are more or less related with the project definition. The higher the rating the more accurate and more important the result is. A snippet is a part of a document. There are many cases where not the whole document is considered relevant to a project, only a part of it and snippets are there to support that. Query This class includes all information for queries entered by users. The attributes included are the site (search engine) the query was executed at, and the query string that was used. Once the XML (Figure 18 shows an example XML) has been parsed, all data objects (projects, result sets, results, queries) should be available in the memory. Since data from the server might get updated, as users post new results or update existing ones, an option to resynchronize data is offered. The option performs exactly the same procedure except using the new data from the server. From then and on, every subsequent activity should only work with data from the memory. This provides a fluid and efficient framework to work with and avoids additional calls to the remote server. Additionally, Results Space offers an option for the user to specify where the primary server resides in case the server changes location or to aid load balancing. Multiple servers can be deployed at different locations to accommodate increased amounts of data requests and higher user counts. Additionally, in mobile applications it is safe to assume that the users will not be in the same location at all times, so a user may opt to choose the closest available server to his location in order to reduce latency during synchronization. To do this, the user will have to go through the Preferences activity which is discussed below. In addition, this reduces the amount of requests by splitting traffic amongst different locations. Support for receiving data simultaneously from multiple servers is not part of the first version of Results Space Mobile application and in this version only one server can be specified. Finally, Results Space Mobile is not able to update data and so there is no need to handle sending data back to the server. Due to the nature of the data, Results Space utilizes list activities and expandable list activities. Both are extensions of the default super class Activity. Their implementation allows displaying data in a list view and in the case of expandable lists each item can contain sub nodes. Thus, such activities are a good fit for Results Space mobile. LIST ACTIVITIES AND ADAPTERS By default every list and expandable list activity must include a ListView or ExpandableListView object in their XML layout file. An exception is thrown if this view is missing. Android: Setup Hello, World: Android Edition. due by noon ET on Wed 2/22. Ingredients. FileMaker Server 12 FileMaker Server Help 2010-2012 FileMaker, Inc. All Rights Reserved. FileMaker, Inc. 5201 Patrick Henry Drive Santa Clara, California 95054 FileMaker is a trademark of FileMaker, Inc.
Now that we have the Android SDK, Eclipse and Phones all ready to go we can jump into actual Android development.